Innovative concept of stirrups for young children who cannot access to the motorbike footrest. This item is auto-locked and without any bidding. 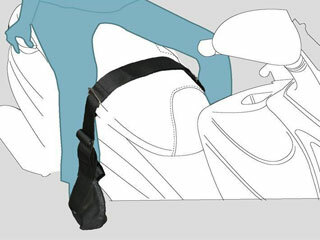 The EASA stirrup have to be hooked on to the motorbike seat by 2 claws with an opposite support effect* : more the child leans on the stirrup , more the item holds on the seat. It is perfect for daily utilization in « urban mode » and « long trips » : quick set up, easy utilization and compact size. *The effort makes by the passenger on the left stirrup is transmitted to the right stirrup as support force and vis-versa. The device does not constitute a retention device as defined in the guidelines and regulations in the EEC and therefore cannot be regulated by EEC homologation. Does not fit all vehicles, including those where it can be in contact with moving parts such as wheels and chains.